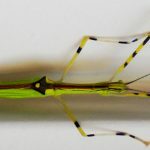 The stick insect species Necroscia annulipes is a beautifully colored stick insect from Malaysia. It can be kept and bred as a pet and is very popular because of its beauty and the ease in which it can be bred and fed. 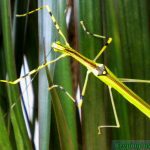 Like almost all stick insects it has a Phasmid Study Group number or psg number: psg 290. 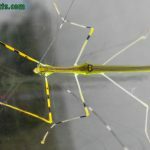 It does not have a common name in English, although some people call it “Yellow Flying Stick”. 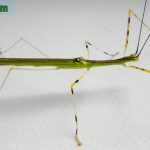 As young nymphs this species is just light green. Not too special, even though the color of green borders on fluerescent. Here and there you will find a black spot, but in general the nymphs are entirely green. The adults of N. annulipes are the most beautiful. The adults have a beautiful pattern in yellow, black, red, green and blue. 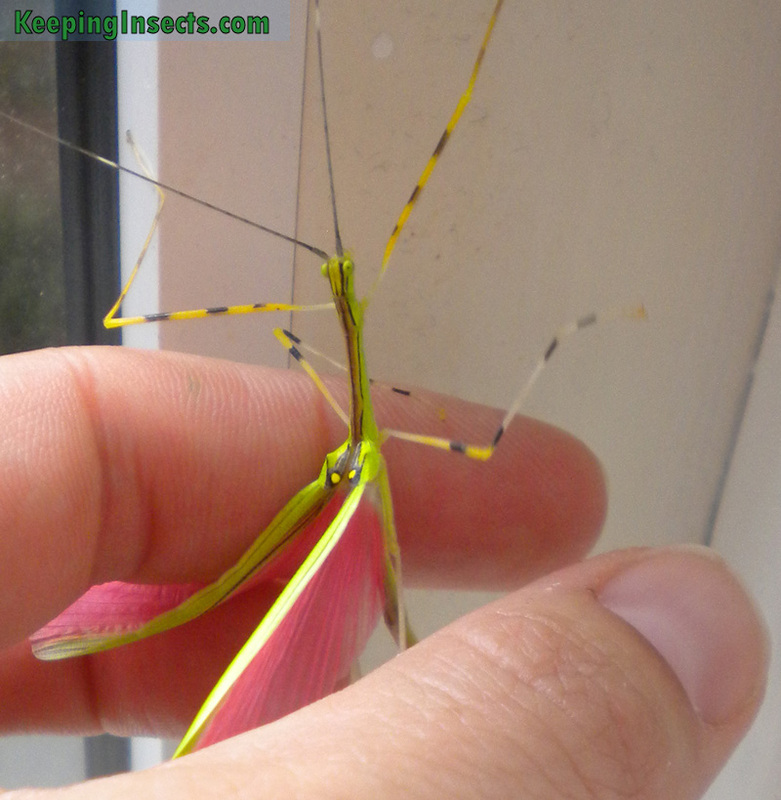 Adults also have wings, those are a very bright light pink. The nymphs do not have wings, as in any stick insect species. The body shape is like a stick, without any additional lobes or shapes. 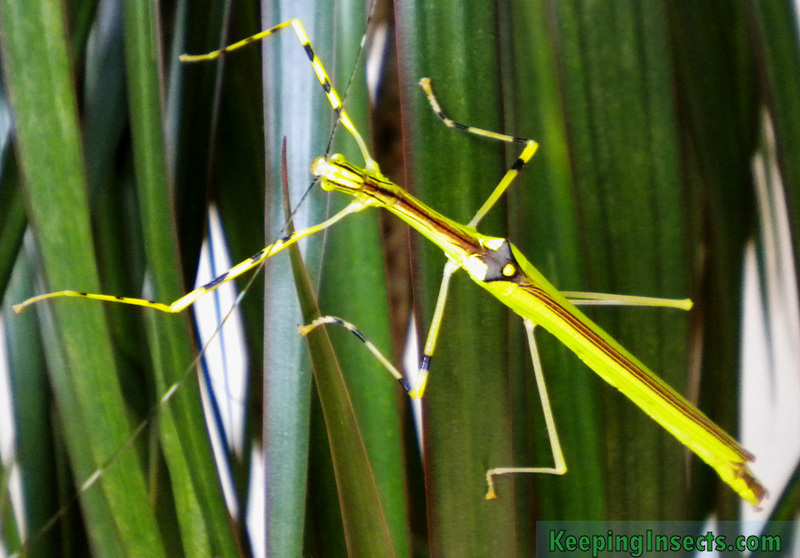 The antennae are very long and striped in black and white. 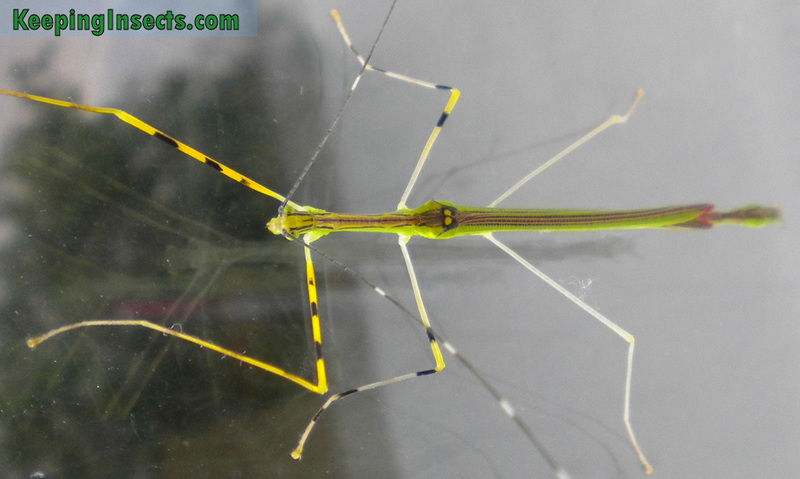 The first two sets of legs are striped in yellow and black. The body is light green with a brown-red stripe running down the middle of the back. At the last set of legs you will find two small wings, those are blue with black and have yellow dot. Under these small wings you will find the big wings that can be used to fly. Those are neatly folded over the entire abdomen (last bit of the body) and are colored the same as the body. When the wings are unfolded to fly you will see that they are bright pink. You can’t see anything pink when the wings are folded up. Adult males are 7 cm (3 inch) in body lenght and adult females are 9 cm (almost 4 inch) in body lenght. 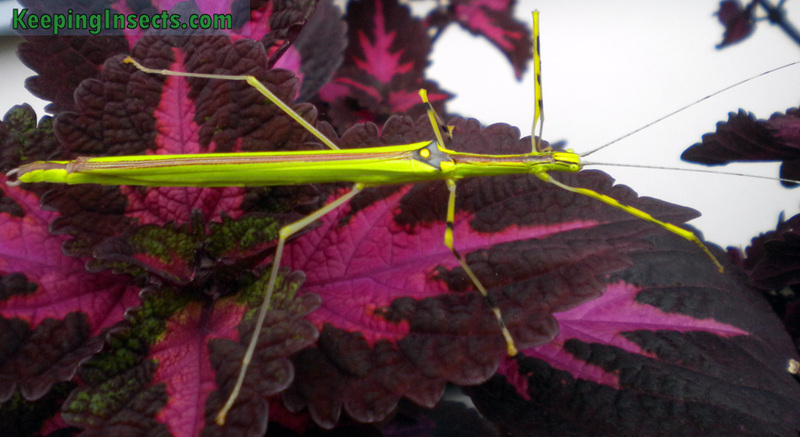 You could add the long legs and antennae to that to arrive at a lenght of 15 cm for the females. The males and females look pretty alike, but the males are smaller and thinner. The end of the abdomen also looks different, the males have claspers which they use to hold the female when mating. The females have a structure at the end of their abdomen to stick eggs into soil or soft substrate. This species is very quiet and will not move around during the day. At night they are active and will eat, walk around and mate. 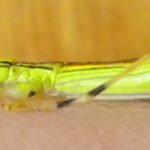 The nymphs are easy to handle, they will try to stay immobile when you touch them. Sometimes they will drop themselves to the floor when you touch them. The adults are a little bit hard to handle because they can fly. They will fly away when threatenened. Their flight is calm and not that fast. Generally they will fly to light, so to windows. Make sure you close your windows when you handle adults of this species. Both males and females are able to fly, but males are lighter and more abt. If you annoy this species too much by grabbing it, it will release a smelly liquid. It is not known to cause any allergic reactions or irritation. The smell is unpleasant but will disipate soon. It is meant to scare away predators. 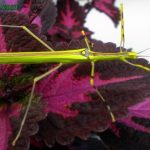 Necroscia annulipes is easy to feed, as it eats privet. Privet will stay green even in winter and grows in many places. 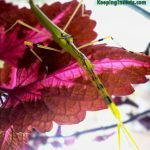 This species also eats the leaves of lilac, olive, osmanthus, jasmine and Cinnamonum (cinnamon tree) and other members of the Lauraceae family. Necroscia annulipes is easy to keep. It needs room temperature, 20 °C to 25 °C but can handle up to 35 °C easily. The young nymphs need some proper humidity, of around 70 – 80% air humidity. Spray their enclosure every few days. The adults need less humidity as they are not shedding their skin anymore. 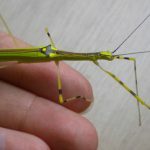 As with all species of stick insects, Necroscia annulipes needs an enclosure that is at least 3 times the length of the animal in height, and at least 2x the length of the animal in width. A good size for a few Necroscia annulipes is 45 cm high (about 18 inch) and 30 cm wide (approximately one foot) but bigger is always better. Cover the floor of the terrarium with something that can mitigate humidity, like soil or tissue paper. You have to annoy them a bit to take a picture of their pretty pink wings. 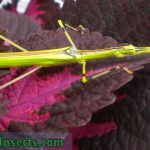 This species is easy to breed because they are a hardy species that will survive easily. When they are adult for around 2 weeks they will start to mate. The females produce a lot of eggs. They like to deposit them in something soft, like soil, florist foam or tissue paper. It is important to place a proper egg depositing spot in the terrarium. You can leave the eggs there or collect them. Keep them moist and keep them at 20 °C to 25 °C. It takes 4 to 5 months before the eggs hatch. It takes another 4 to 5 months for the nymphs to become adults. Adults can live up to 9 months for females and 6 months for males, depending on the temperature they are kept in. 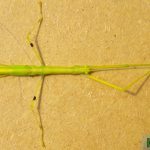 This female nymphs shows its default pose for looking like a stick. Legs tucked in, head hidden between the front legs. Only the middle legs are there to stay stable.